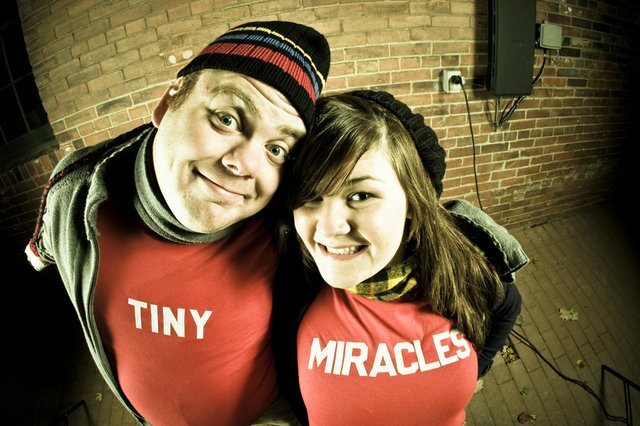 Pat Thornton and Sara Hennessey's Tiny Miracles comedy fundraiser tonight will raise funds for care packages for the needy. Photo by Tony Lombardo. FOOD: The West End Food Co-op’s Sorauren Farmers’ Market is taking Boxing Day and January 2 off, so today’s your last day for a few weeks to visit the open-air bazaar to pick up locally raised beef from Field Sparrow Farms, a vegan tofurkey for the holidays from Ying Ying Soy Food, or “bike-powered chocolate” from ChocoSol Traders. Harpist Lutia Lausane will be playing seasonal music throughout the afternoon, too. Sorauren Park (Sorauren Avenue & Wabash Avenue), 3 p.m.–7 p.m., FREE. THEATRE: We gave Soulpepper’s Parfumerie four stars in our recent holiday show round-up, and the repertory schedule has the comedy, which was the source material for a number of hit Hollywood films like The Shop Around the Corner and You’ve Got Mail, playing tonight. The play, starring a number of Soulpepper favourites, closes on December 28, with just five more performances after tonight’s. The Young Centre (55 Mill Street), 7:30 p.m., $31.65–$67.81. COMEDY: Pat Thornton and Sara Hennessey‘s annual Tiny Miracles comedy fundraiser is supporting holiday care packages for people living on the street for a sixth year. For the fundraiser, they’ve put together a night of laughs with some of our local favourites, like character comic Kathleen Phillips, Sarah Hillier (2011’s Best Female Improviser), and recently unretired stand-up Mark Forward. Comedy Bar (945 Bloor Street West), doors at 7:30 p.m., $10. MUSIC: The Hamilton Trading Co.‘s foot-stomping, dozen-strong acoustic roots choir, led by guitarist and composer Keith Hamilton, seems a perfect fit for the cozy and countrified Dakota Tavern, so we’re surprised that tonight actually marks their debut at the underground hot spot. The HTC will be opening for current Monday-night resident act the Sure Things. Dakota Tavern (249 Ossington Avenue), 10 p.m., PWYC.